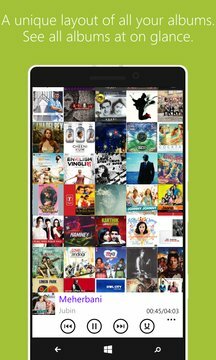 Music Wall is a simple music player with a unique layout that generates a wall of all the albums in your library using their respective album arts. It comes with a wide array of settings for customizing the wall. 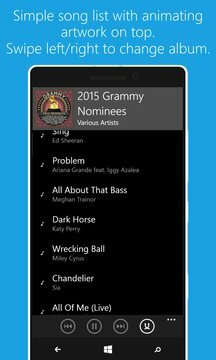 • Added introduction for the new Music Wall application. Please rate and review it. For support, see the 'help & about'. Do try it. Note: Due to limitations of the Windows Phone OS, song seeking, fast forward, fast rewind and volume level control cannot be implemented via app. Use the volume-button music controls to achieve this.